Signup for updates and our newsletter! No Spam Promise! We hate spam as much as you do. Egly-Ouriet Champagne is one of the best known Grower Champagnes, in part because Michael Skurnik Wines has been importing them into the USA for a long time, well before the term Grower Champagne entered the oenophile vernacular. Egly-Ouriet wines are rich and full bodied, in part due to a minimum of three years of aging on their lees, in part due to an average age of the vines being over 45 years, and in part due to the fact that they are Pinot Noir heavy. Although I enjoy them by themselves, they are perhaps better with food than as an aperitif. Francis Egly skilled winemaking no doubt plays a major part as well. Francis Egly is well regarded as a skilled winemaker and he makes these wines together with his father Michel. The vineyards were inherited from Grandfather Charles for a total of three generations of Eglys. Egly-Ouriet has 8 hectares of vines in Ambonnay, 0.3 in Bouzy and 1.4 in Verzenay and these are 75% Pinot Noir and 25% Chardonnay. They have also more recently acquired 2 hectares of fantastic old vine 1er cru Pinot Meunier in the village of Vrigny. Yes, Pinot Meunier can be fantastic as their 100% Pinot Meunier N.V. Egly-Ouriet Champagne Brut "Les Vignes de Vrigny" 1er Cru proves. In total they have 11.7 hectares of vines. These are quite terrior expressive wines and are unfined and unfiltered, which may be commonplace in some areas but not in Champagne. They are also aged in oak, not a common practice as well except among some top tier producers like Krug, Jacques Selosse and Bollinger. Aggressive green harvesting is done during the summer (removing grape clusters so the remaining ones get more nutrients and concentration), reducing yields to about 50% of what is most common in the region. They also manage their vineyards in ecologically sound ways. They have reduced the use of all chemicals, including herbicides, fertilizers, and pesticides, use manure commonly for fertilization, and have always refused to fertilize with "gadoux" like many others do (basically ground up garbage from Paris - yuckk!). 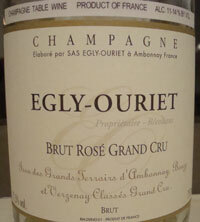 Egly-Ouriet is also low-dosage, meaning very little addition of a sugar before final corking. Some is most common to balance the high acidity of Champagne. A lovely copper color with a tinge of pink. Rose petals and red apples on the nose. Distant coffee notes. The palate is filling with ripe red apples, citrus tones, and a mélange of fruits. A big powerful wine. It's 65% Pinot Noir and 35% Chardonnay, pretty much the same blend as the Brut Tradition, NV, with about 8% still Pinot Noir added.